If you remember from our Fairfax Stone story, the West Virginia – Maryland has a controversial history that dates back to colonial days. 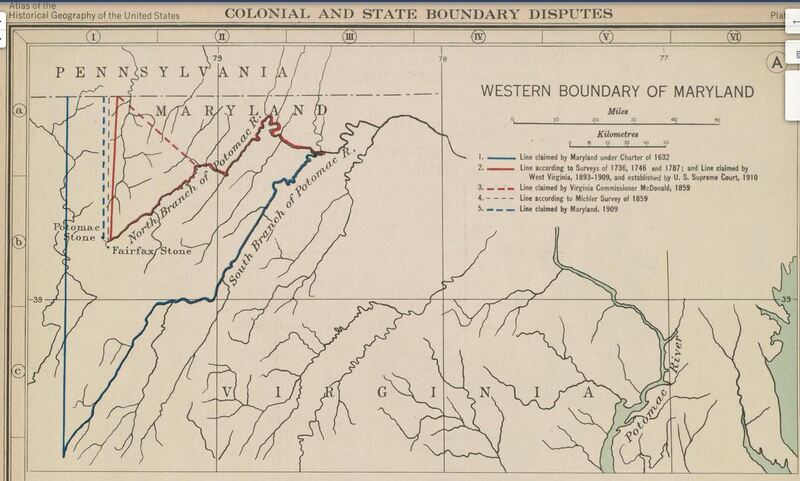 We recently found this historical atlas map of the boundary, and the various lines claimed over the years by West Virginia (and Virginia before it) and Maryland. In this map, you’ll notice that the original boundary claim by Maryland was for the South branch of the Potomac, which Lord Baltimore (of Maryland) apparently had marked in 1771. This claim would have given Maryland much of the eastern panhandle of current day West Virginia, as well as land in Preston, Randolph and Pendleton Counties! [Click the image for a bigger view]. Atlas from Charles O. Paullin’s Atlas of the Historical Geography of the United States, 1932. To read, listen, and learn more about the West Virginia – Maryland border dispute, and to see more images, click here and check out our story on the Fairfax Stone.